While a bill that would have prohibited the use of tiny microbeads in face wash and other personal products nationwide died in Congress last year, California didn’t give up its fight to keep the microscopic plastic spheres from entering its waterways and turning up inside the stomach of consumers’ seafood, passing legislation that bans the use of the products in the state by 2020. The Associated Press reports that California Gov. Jerry Brown signed legislation Thursday that would phase out the use of microscopic exfoliating beards in personal care products sold in the state. The bill, known as AB888, seeks to restrict all use of the non-biodegradable beads that can contain various toxins, said Assemblyman Richard Bloom, who introduced the legislation earlier this year. California lawmakers previously attempted to ban the use of the beads, but those measures fell short, in part because of opposition from personal-care product companies. The newly signed law was successful after several amendments promoted business critics to drop their opposition, the AP reports. The small bits of plastic, often found in face washes, soaps and toothpaste, have become a hot topic for lawmakers and environmentalists in recent years, with many states acting to end the use of microbeads. Last year, Illinois became the first state to pass an ordinance that would gradually fade out the use of microbeads beginning in 2017 and ending in 2019. The state bill even had the cooperation of product manufacturers. An official with the Chemical Industry Council of Illinois said at the time that the quick deal resulted from unique circumstances, and the availability of substitute ingredients, such as oatmeal and sea salt. New York has often been in the forefront of the fight to ban microbeads for commonly used products. Officials with the state estimate that 19 tons of the tiny beads enter the states waterways each year. Last year, a report issued by the New York Environmental Protection Bureau outlined just how unsafe the small plastic pieces can be. According to the report, after microbeads are washed from our bathrooms, they easily travel through wastewater treatment plants and enter our waterways. The tiny beads then act as sponges for toxic chemical pollutants and become an attractive snack for marine wildlife. And because we humans often like to eat seafood, that means there’s a pretty good chance the spheres could end up in your stomach. 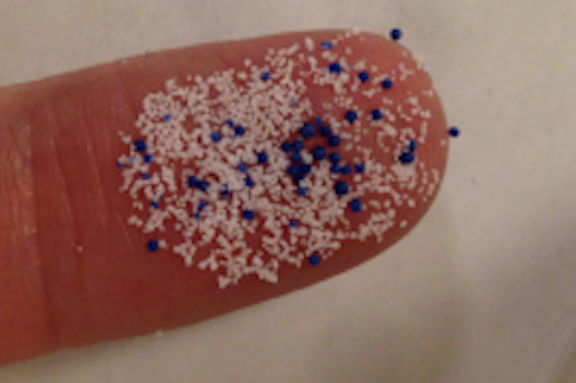 Despite the findings, legislation to phase out the use of microbeads state-wide has passed the New York Assembly twice in the last two years, but has stalled in the Senate both times. In February 2014, L’Oréal said it would begin phasing out the materials this year in their Biotherm products and continue with Body Shop products in 2015. All of the company’s products are expected to be microbead-free by 2017.